The clubroot region expands each year, with clubroot again being found in new fields in known clubroot areas and in new areas across the Prairies. How are fields exposed to clubroot? We often hear of cases where farms and fields had never detected clubroot before and then suddenly it can be found throughout a field. In all likelihood, clubroot had been there for a number of years and through a couple of canola cycles in that field before it reached obvious levels. How did that happen? I have a clubroot patch in the middle of a field and that field hasn’t produced canola in years. How is that possible? While this scenario is less common, it is possible. 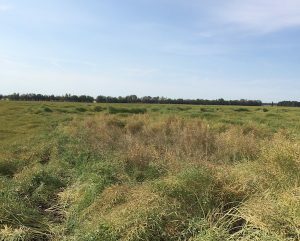 Even if the field has never grown canola, the cultivator used to break up a hay field, for example, could have had clubroot-infested soil on it. Wind and water erosion can also move infested soil. Runoff could have carried infested soil over land to a low area in the middle of a field. Spores then just waited. Brassica weeds such as mustard, stinkweed and shepherd’s purse will host clubroot and form galls, so weeds in that low spot could have built up soil spore loads. If the field produced a canola crop many years earlier, plants in that clubroot-infested low spot could have had low to moderate levels of clubroot infection that went unnoticed. But those small galls would have stealthily released a potentially devastating amount of spores. When canola is finally planted in that field, the disease could be unexpectedly severe in that out-of-the-way patch. Another of question in that article is “Should I use my own combine to help a neighbour harvest?” Read the article. Whole fields of wilted looking plants could be the result of heat and drought. Random discoloured (even purplish) plants could result from root damage by root rot or root maggot. Patches with purpling along with cupped leaves and pale small flowers could be sulphur deficiency. Also take a look for blackleg lesions and signs of sclerotinia stem rot infection. While no management options are available for clubroot, blackleg and sclerotinia stem rot at the late flower and pod stages, assessment now and through to harvest can point to increased management requirements (including genetic resistance, resistance-gene rotation and extended crop rotations) in following years.